Project Tool is a dance performance installation in which I have been building a collection of sprung wood dance floors with a team of collaborators. What is learned physically, emotionally, and conceptually in the process of building has become the material used to craft the performance. This project stems from my fascination with the inter-relationships between body, task, and tool. Artist Steve Silber designed hexagonal modular floors that can be arranged and configured in numerous ways to transform many different types of spaces into places where performance (dance performance, particularly) can happen. The act of building this floor explores the use of tools as if they are partners in a dance with the body. This project carries on through my body and the bodies of other dancers who participate through the skills and know-how to make the floors upon which we dance and the opportunity to channel that practicality into our artistic practices. Project Tool offers us the opportunity to stand strong in the embodied fact that we can literally build our own platforms. Thursday, JAN 25 @ 5:30pm Exhibition Opening Reception, Conversation with Artist, and Sample Performance. 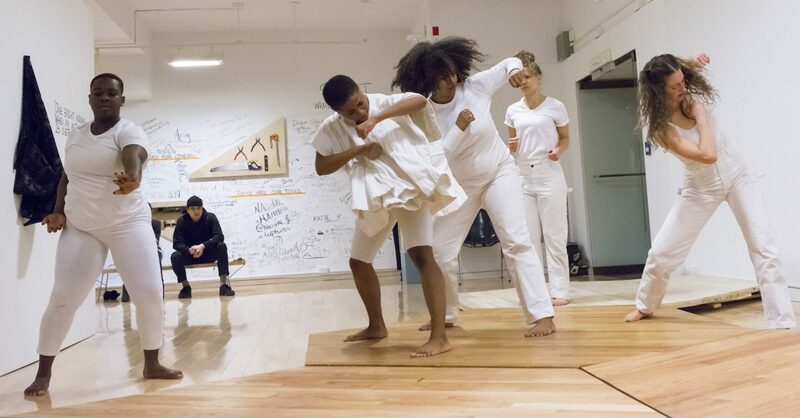 Project Tool is a 2016 Chicago Dancemakers Forum Lab Artist recipient as well as a National Performance Network (NPN) Creation Fund Project co-commissioned by Links Hall in partnership with Dancing Grounds and NPN. Project Tool was supported by a Rebuild Foundation residency at Dorchester Art + Housing Collaborative. This project is also partially supported by an Individual Artist Program Grant from the City of Chicago Department of Cultural Affairs & Special Events, as well as a grant from the Illinois Arts Council Agency, a state agency through federal funds provided by the National Endowment for the Arts. Finally, this project was made possible through a grant from 3Arts that was partially supported by 67 donors to 3AP (3Arts Projects), including: Dawoud Bey, Dionne Champion, Margi Cole, Osubi Craig, Kristina Fluty, Darrell Jones, Stephanie Kobes, Lisa Lee, Jewel Malone, Mazi Mutafa, Pranita Nayar, Eliza Nichols, Chiedu Ozuzu, Justin Richards, Donatto Surratt, Kubilay Uner, Zachary Whittenburg, Fo Wilson, and The Instigation Festival.